Convert a DVD to digital copy in 5 minutes with flawless 1:1 quality! Designed to simplify your life, the program provides you with the best solution to back up your DVD collections. You can convert the disc into digital for personal use to watch your favorite movies on your PC, iPhone, iPad, Tablet and any more. Moreover, it adds optimized presets for devices such as the latest iPhone X, iPhone 8, Samsung Note 8, Huawei P10, LG V30, etc. And it's a zero-difficulty tool, with only (Load DVD > Output Format > Get Started) three steps to finish the work. Blazing fast ripping speed, but preserves high original quality. WonderFox DVD Ripper Pro Lifetime (1 PC). It's only $24.95 to buy. WonderFox DVD Ripper Pro Family Pack (3 PCs). It's only $39.95 to buy. WonderFox DVD Ripper Pro+HD Video Converter Factory Pro Pack. It's only $34.95 to buy. 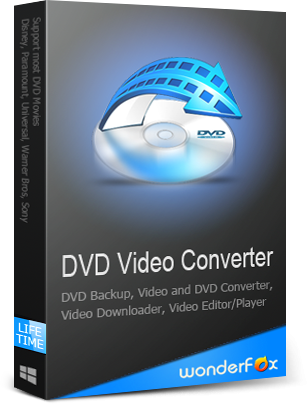 WonderFox DVD Video Converter is a one-step DVD converter and video downloader. Helps you to deal with all video and audio playback issues. It's been a loooong time since the last giveaway of WonderFox DVD Ripper Pro was running at GOTD. We're excited to present you with the brand-new, powerful and easy-to-use program. Speaking of new features, please download the latest version to enjoy. 1. Download WonderFox DVD Ripper Pro from GOTD promotion page. If you have a registration problem, please leave your question here or send email to support@videoconverterfactory.com. As usual, the Giveaway Version has the same functions as the Full Version. But it does not support free upgrade. What format do I use to copy a DVD in 5 minutes? I've tried a couple of different formats and time has been anywhere from 35 minutes to 2 hours. It takes however long to copy roughly 4-8 GB from a DVD optical disc, & that's the baseline minimum when you're just copying -- no conversion. And that time is determined by the optical drive, your target hard drive, the PC/laptop both are connected to etc. Copying that amount of data from any DVD disc, I've never seen it drop much below 15-20 minutes personally, regardless what type of files were involved. "It supports 1080P Full HD Video Conversion as well as stable, flexible and super-fast online video downloading. Want to say goodbye to the times when you spend several hours to rip and convert your favorite DVDs? Here’s the way." This is very misleading since 1080 is BLUERAY, not DVD! JEB, 1080 is not necessarily Blue Ray. My phone shoots 1080 and it's not Blue Ray. Joe Schmoe, Sorry, 1080 is not just Blu-ray. Go read up on it, you'll see, that 1080 is not just Blu-ray.